Mélange - ZineWiki - the history and culture of zines, independent media and the small press. 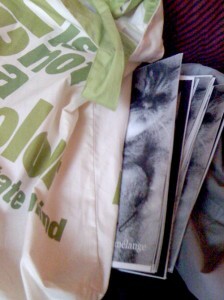 Mélange is a perzine by sandy, an Australian zinester. 32pp, 1/4-sized DL, b&w, released 2009. From zine page: Full of pictures, designery & words on becoming yourself as you grow up, evolving as you say goodbye to old habits. Out of print. 32pp, 1/2-sized (A5), b&w, released 2010. From catalogue on Black Budgie Zines: Mélange #2: Sensualist is a beautiful and tongue-in-cheek journey through one's relationship with sustenance and alcohol. From the 5 senses of wine to anatomizing a hangover, Sandy's meditations on food and drink are both entertaining and enlightening in their exploration of what food means to us and how it connects us with each other. Out of print. This page was last modified on 25 June 2012, at 01:48. This page has been accessed 3,541 times.